We've been exterior-focused on the house as of late. Not that we are doing anything about it...just a lot of talk of how things could be improved outside. Our petite estate does not need a fence, but if it did, isn't this one just lovely? I love it when careful detail is brought to outdoor, functional components. 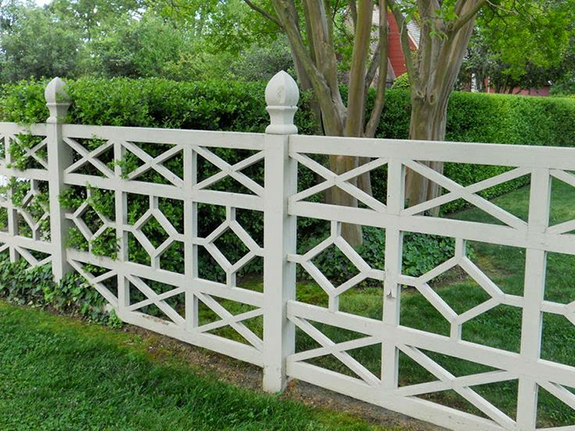 I would especially love this fretwork fence outlining my horse farm in Albemarle County, Virginia. We have a packed weekend of family fun that I am very much looking forward to. I hope you have a lovely Mother's Day, be it as a child or a parent. Enjoy your weekend...see you next week! It is beautiful. I can picture driving down a road and seeing this lovely fence surrounding a property! !